Setting up a camp for displaced Idlib residents in Hirjilla near Damascus, Syria, on August 4, 2018. No one planned for a verdant region in Syria's northwest to become the site of the rebels' last stand. But with the Syrian government preparing for a multi-front offensive it hopes will provide a path for finally ending a grinding civil war, the fate of Idlib province and its 3 million residents are now the subject of diplomatic jockeying among the world powers that have had a hand in the war. As government forces overpowered opposition enclaves one by one, they offered defeated rebels and their families a choice: Lay down their arms and accept government rule, or go to Idlib, which borders Turkey. Many chose Idlib, doubling the size of the province and turning it into a dumping ground for opposition militants. But now as the government masses its troops near Idlib for an offensive it says could come any day, its military planners will have no such exit plan to offer Idlib's rebels. The United Nations warns that hundreds of thousands could be displaced by a Syrian assault on Idlib, many of them people who've been displaced before. 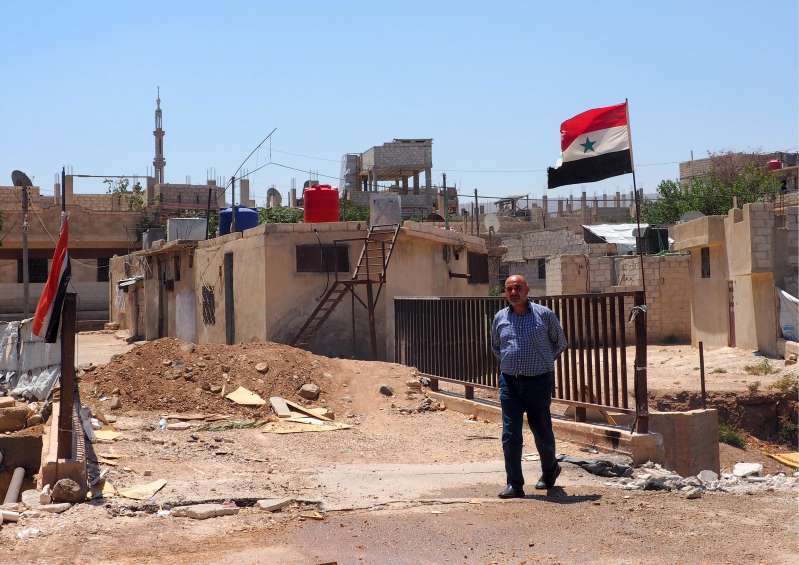 Though rebel forces could decide they have no choice but to remain in Idlib and fight back, others could try to flee to Turkey, which hardened its border once the Syrian government took the upper hand in the civil war. Turkey's foreign minister cautioned that bombing the province would be catastrophic "not only for the Idlib region but for the future of Syria," and the United States said it is poised to strike if Syria uses chemical weapons in an attack. Russia, meanwhile, has warned the U.S. and its allies "against any new reckless moves," and it dispatched two additional frigates this week to bolster its fleet off Syria's Mediterranean coast. For residents in Idlib, there's much to fear. Wherever the Russian-backed Syrian army and its associated paramilitary factions have gone, destruction has followed. "Some people have already lost everything, but for most of us, we're terrified. The regime, wherever it hits today, it strikes a family. Every time a plane drops a bomb, it kills a family," said Wael Malshi, 45, a day laborer in Idlib contacted via the WhatsApp messaging service. Kathem, a 52-year-old fruit vendor who used his first name only out of fear for his family, said he'd already been displace twice and now expects he and his family will be killed in Idlib. "It's all useless. We've been sent here to die," Kathem said in a WhatsApp conversation. He suggested the government would use the jihadis who have settled in Idlib as a "pretext to bomb us without mercy." At the same time, those who have attempted to negotiate reconciliation deals to spare the region's villages have been arrested by the province's primary defenders, the Al Qaida-linked Organization for the Liberation of Syria, which sought to turn Idlib into a Talibanesque Islamic emirate. The jihadis also vowed to attack any group that surrenders. The group has also been a liability for a civilian population in which most people depend on humanitarian aid: Much of the international community, including the U.S., considers the Organization for the Liberation of Syria to be a terrorist group and has suspended aid programs. Moscow, meanwhile, uses the presence of the group to justify its offensive. Other groups in the province, including some factions more palatable to the West, saw their support dry up long ago, and nothing has changed in the run-up to an offensive, said Jamal Maarouf, a rebel commander and onetime recipient of U.S. support who was ousted by the jihadis in 2014. "Al-Qaida destroyed the revolution, but we didn't invite them in. All the nations who made it easier for jihadis to enter Syria, they should deal with the true revolutionary factors, bring them back to Idlib to destroy the terrorists," Maarouf said in a phone interview last week from southern Turkey. But he also insisted there was little point in negotiating with a government "that has engaged in mass killing." That has left many civilians looking to Turkey, whose government has become a vital overseer of rebel-held areas in the north. Turkish aid organizations such as IHH Humanitarian Relief Foundation provide basic supplies, including 2 million loaves of bread every day to Syrians. Millions of dollars' worth of goods pass every day through Bab al Hawa, the opposition-controlled crossing on the Syrian-Turkish border. Turkey also has established a presence in Syria: Its postal service is used to transfer aid money to local humanitarian organizations. In some parts of the province, it's the Turkish flag that's flown. And many of the more moderate rebels depend on the Turkish army for training and support. But Turkey, which has taken in more than 3.5 million refugees and once supported an alliance that included the Organization for the Liberation of Syria, is eager to repatriate Syrians and has sealed its border. "It would be a massacre to bomb Idlib, civilians, hospitals, schools just because there are terrorists," Turkish Foreign Minister Mevlut Cavusoglu said at a recent news conference, Turkish media reported. In recent days, Syrian state and pro-government news outlets reported significant troop movements, with the army's elite Tiger Forces and 4th Division already massing near Idlib. The government has even brought in reconciled rebels from vanquished enclaves to fight against their former brothers in arms. But figuring out who is a jihadi, rebel or civilian is difficult in a province where militants' bases are often integrated inside a town or village. Washington, meanwhile, has threatened to strike government forces if they attack Idlib's rebels with chemical weapons. Damascus has been accused since 2013 of deploying munitions filled with chlorine and sarin on opposition areas; one attack in April prompted a missile strike on government targets by the U.S., France and Britain. But Russia, whose primary air base in Syria is less than 40 miles from Idlib, warned the U.S. and its allies "against any new reckless moves," according to a statement by Russian Deputy Foreign Minister Sergei Ryabkov given to the state-owned Sputnik news network. "We can hear ultimatums voiced by Washington, including public statements," Ryabkov said. "This does not affect our commitment to fully eliminate terror cells in Syria and return this country to normal life." Whatever is decided among the outside powers, however, the jihadis vow they will not succumb to agreements that saw other rebel enclaves emptied, said Abu Mohammed Jolani, the group's commander, in a speech last week. He warned Idlib residents that Turkey could not to be trusted and that its political position could "change from one moment to the next." The only solution, he said, was to mount a unified defense. "Just thinking about surrendering to the enemy and handing them our arms is betrayal," Jolani said.